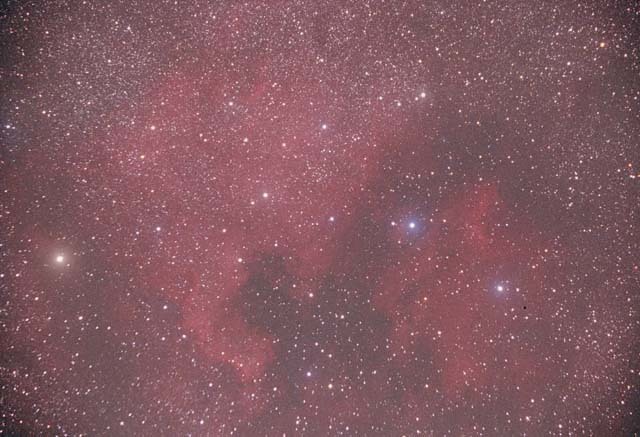 Step 1: This is a photo of the North America and Pelican Nebulae in Cygnus. It was taken with a Tele Vue 85 @ 480mm-f/5.6, which yields a field of view of 3.4° x 2.5° on 35mm film. This was a 60 minute exposure on Kodak PJ400 negative film with no filtration. The sky conditions were 7/10 transparency, 8/10 seeing, and 6.0 LVM. The ST-4 got A3's at 700mm. Step 2a: This is a raw scan of the full frame from a Polaroid SprintScan 4000. The TIFF file is about 20MB. This scanning step takes about 15 minutes. Step 2b: If you use Kodak Picture CD, instruct them (on the envelope) to place the raw scans onto the CD. Vignetting is visible in the corners and edges of this image. Obviously the contrast is low. However, this is how an exposure should look when sky fog is the limit. I use Photoshop 5.5 for all image processing steps. Step 3 (optional): First, I adjust the levels to take advantage of the full dynamic range available. This step takes a couple minutes. 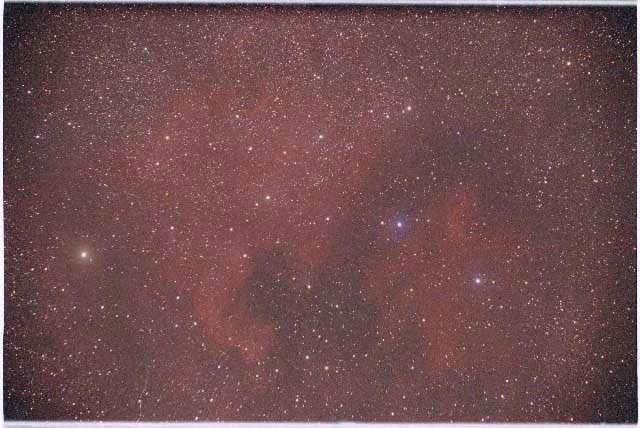 Step 4: I crop the frame slightly to get rid of the worst vignetting. 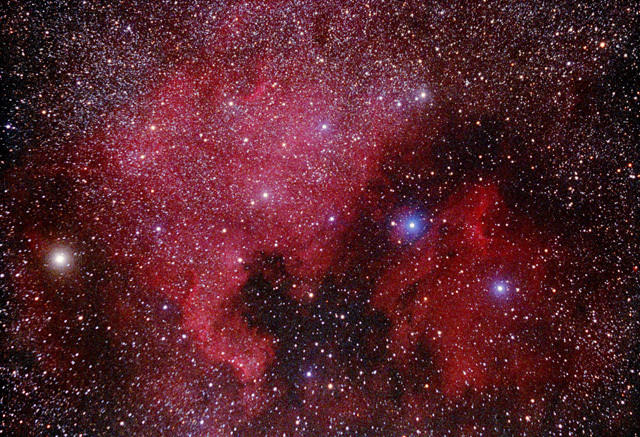 Because I think these nebulae look better with some surrounding space, I do not crop the image more than this, and I accept some vignetting at the corners. This step takes a couple minutes. If I can see the image well enough in the scanner preview (back at step 2), then I crop the image there, which saves time and disk space. Step 5: This step is performed mostly with curves. The trick is to get the background dark but not too dark, keep definition in the image, and saturate & balance the colors aesthetically. The curves technique took me a lot of practice. This step can take 30 minutes or more. Step 6a: Standard photo finishing will not yield prints like this. Even though I get my film developed by an excellent color lab, I never have them make prints from the negatives. I could provide them post processed TIFF files on a CD for printing. However most newer color ink jet printers (e.g. Epson 1280) can render excellent prints on glossy paper cheaper and faster than a lab. Step 6b: My web publication format is generally 640 pixels on the long axis. I use JPEG and try to keep the file size below 200KB. I make my thumbnails 100 pixels square and about 10KB in size.